Ceredigion is to get the largest share of a £1.5 million package from the Welsh Government to help fund repairs to coastal areas following the storms of early January. The county will receive £560,000 towards ensuring that Ceredigion is fully open for business by the time of the main tourist season at Easter. 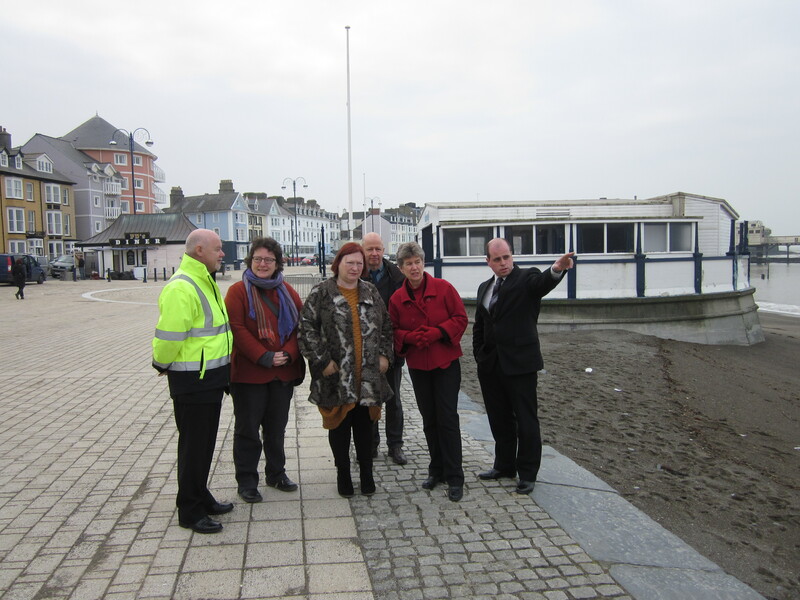 The Government Ministers for Finance and the Economy visited Aberystwyth promenade with me this morning, and we also spoke to leading councillors and officials and to business-owners affected. Since the storms earlier this month, I’ve been speaking to several cabinet ministers within the Welsh Government, pressing the case for Ceredigion which is faced with a huge repair bill. I’m very pleased that they have announced this extra funding. A huge amount of work has already been done to repair damage to Aberystwyth promenade and other locations along the Ceredigion coast – the efforts have been heroic. This money will ensure that the council can go ahead with vital work to support Ceredigion’s tourist infrastructure. By the summer, visitors need to be assured that all that they expect from visiting the area – the wonderful coastal path, the fabulous beaches and all the associated facilities – will be just as they would wish. We had the chance to discuss with the Ministers too other ways in which the Welsh Government could help, including working with Visit Wales on marketing campaigns and special events with the clear message that Ceredigion is open for business.